The Media Prioritization Tool of your Linksys Smart Wi-Fi Router allows you to give bandwidth allocation to devices, applications and games that connect to streaming or real-time media services. In order for this feature to work, the computer or device that you need to prioritize should be currently connected to your router's network. QUICK TIP: The Device List is also known as the Network Map Tool for some Linksys Smart Wi-Fi Routers. To learn more about this feature, click here. Use your mouse cursor to drag and drop Devices from the Normal Priority list to the High Priority section. You can prioritize up to three (3) devices. NOTE: Aside from Devices, you can also choose Applications or Online Games which you want to allocate higher bandwidth priority. To do this, simply repeat Steps 1 to 3 and, instead of choosing devices, select applications and online games from the available drop-down list. To know how to add new applications or online games, click here. 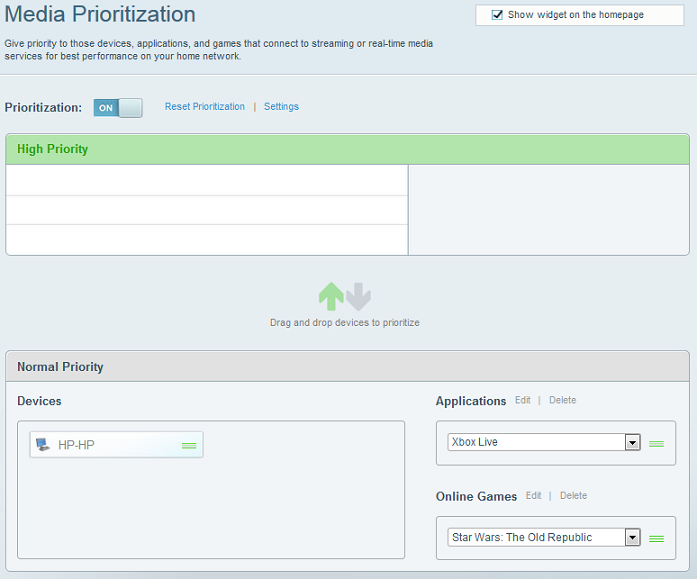 You have just completed the steps to prioritize devices, applications and online games using the Media Prioritization Tool.